Now it appears we know why WorldNetDaily was so desperate for people to join the tour to the Holy Land led by WND editor Joseph Farah and his buddy and meal ticket, Jonathan Cahn: They were planning to stage a publicity stunt to get their tour party kicked off Jerusalem's Temple Mount. A week before Americans gave thanks to God for their blessings in a holiday inspired by Pilgrims who sought religious freedom in the new world, another group of mostly American pilgrims to Jerusalem was ejected from the Temple Mount by Muslim administrative authorities for mentioning that the Jewish Temple rested atop the 40-acre mount until 70 AD when it was destroyed by Rome. That’s right – 406 Christians were forced off the Temple Mount for acknowledging that a Temple once rested there. The incident occurred Thursday, Nov. 17, 2016, when messianic rabbi Jonathan Cahn and I led the group on a tour of the Temple Mount, the holiest site in Judaism and one of great significance for Christians as well. When Cahn, the New York Times bestselling author of “The Harbinger,” “The Mystery of the Shemitah” and “The Book of Mysteries,” simply referenced the Temple, his talk was interrupted by a representative of the Islamic Waqf – the clerical force that patrols the site, enforcing dress codes and often prohibiting Bible reading and prayer by Christians and Jews. 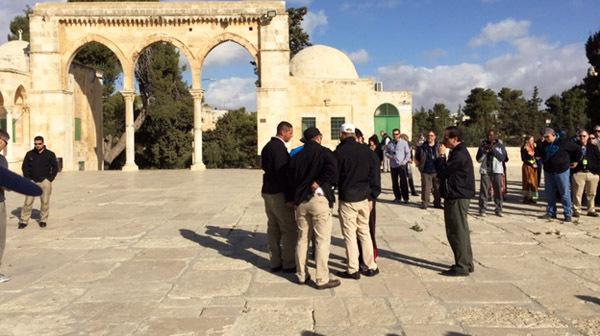 Cahn was told it was unacceptable for anyone to discuss the Temple on the Temple Mount. Muslims do not refer to the Temple Mount as such but call the site Haram al-Sharif, or Nobel Sanctuary. They contend the site is famous and holy not because of the Temple, which some of them even dispute ever existed, but because Muhammad claims to have ascended to the site from the Arabian desert in a miraculous Night Journey on the back of a winged horse. He was just beginning a message on the link between the Temple and the Garden of Eden when the Waqf officials interrupted the talk. They called Cahn to speak to them about 20 yards from the bulk of the group, with me shadowing him. The standoff lasted about five minutes until one of the Waqf officials got louder and more agitated. At that point, Cahn agreed to leave. The Waqf officials escorted the group out the gate facing the north. It regrouped near the Pools of Bethesda, where Cahn finished his message and spoke about the nature of the spiritual warfare we had just witnessed. What Farah and Cahn are calling "spiritual warfare" is actually bad manners on their part -- not to mention a craven, borderline blasphemous stunt. Farah and Cahn knew that things like Christian and Jewish prayer on the Temple Mount are prohibited at the Temple Mount -- Farah even admits that. But Farah misleads by suggesting the prohibition was demanded by the Waqf; in fact, that's the official position of the Israeli government. Further, it appears Cahn, a messianic rabbi, may have violated his own faith in doing so; the Chief Rabbinate of Israel states that the Torah prohibits Jews from entering the Temple Mount. All this means that their plan all along was to break rules and create a scene -- all the more spectacular when a large group of tourists are made unwitting pawns in their stunt. Needelss to say, Farah got video of the conflict they provoked, and it's attached to his column. Farah and Cahn were guests, and as guests you abide by your host's rules. You do not treat them with disrespect and provoke conflict. The fact that the two planned to break rules and cause a scene while dragging their tour group through the manufactured drama exposes them not as the religious heroes they claim to be -- "To be kicked off the Temple Mount for speaking truth was an honor," Cahn said, adding, "Nothing stops the purposes of God" -- but as self-centered jerks.